CONTAINS 40 MG ASCORBIC ACID (VIT C) per capsule to help increase uptake of blood folate levels and as an antioxidant to maintain stated potency and stability, so it can work to the best of its ability. NO FILLERS, BINDERS, or PRESERVATIVES – Lupus Health Shop works hard to provide products that interfere with your immune system. * It all starts with how products are made and what companies use to extract the vitamin/supplement. This folate really does work wonders. I take it for migraines and I have one maybe 2x a month now. I also have a hard time absorbing vitamin B, since this is already metabolically available, it’s easy on my body’s ability to absorb and use! Doctor’s Best products are tested before formulation AND AFTER EACH PRODUCT is complete. Most companies don’t do that. folate over folic acid is the way to go if you actually wnat to make your health better. Plus, you won’t waste your money anymore. I will continue with this as part of my treatment and you should too! Folate is much better than folic acid (thanks for explaining in your blog about vitamins!) I take this to help with my brain fog and will continue! USING FOLATE IN REPLACE OF folic acid allows the body to absorb it easily because our body recognizes this form since it’s not the synthetic version like folic acid. Folic acid is the fully oxidized compound that has to be converted by the body to the active form, making it harder on our body to get the nutrients it so desperately needs. THOSE WITH THE MTHFR gene mutation (very common) can’t break down folic acid and it becomes toxic in the body. By taking folate, the bioavailable form, your body is able to use it and not suffer. *IT PROVIDES 5-methyltetrahydrofolate (MTHF) from Quatrefolic®. It is the active form by the body for DNA regulation and other fundamental metabolic processes. The body cannot make folate on its own and must obtain MTHF from foods or dietary supplements. HELPS REDUCE THE RISK OF HEART DISEASE because it can lower levels of the amino acid, homocysteine which can be a common elevated marker for those with Lupus too. APPROXIMATELY 60% of U.S. adults have a genetic mutation (MTHFR gene mutation) that makes it challenging for their bodies to create enough 5-MTHF even with eating dark, leafy greens. By supplementing with proper folate, it can help minimize deficiency. 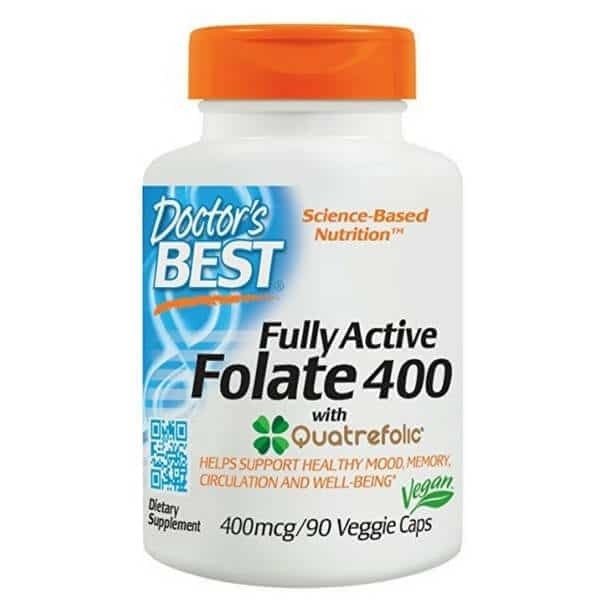 DOCTOR’S BEST FULLY ACTIVE Folate with Quatrefolic® is a B vitamin that supports healthy mood, memory, circulation, and well-being. Us Lupus warriors could use some of that! How do I know if I’m deficient in Folate? Take 1 capsule daily, preferably between meals. Store in a cool dry place. 5-methyltetrahydrofolate (5-MTHF) supplementation is not recommended concurrent with methotrexate cancer therapy, as it can interfere with methotrexate’s anti-neoplastic activity. The body doesn’t produce folate on its own which is why it’s important to eat proper foods and take supplements. Vitamin C (as ascorbic acid), (6S)-5-MethylTetraHydroFolate (MTHF), (elemental, as 800 mcg (6S)-5-Methyltetrahydrofolic acid, glucosamine salt (vegetarian source)), Modified cellulose (vegetarian capsule), cellulose. WHAT MAKES DOCTOR’S BEST BETTER THAN THE REST? 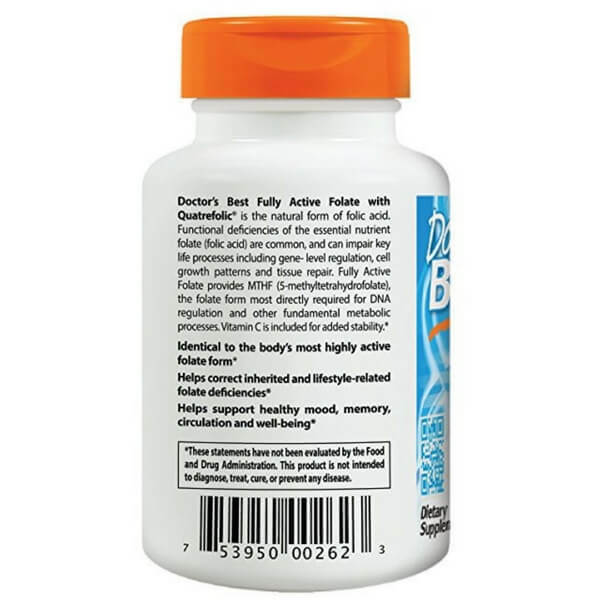 Doctor’s Best products are quality tested and manufactured in the United States using highly qualified cGMP manufacturers and raw material ingredients. They source raw materials from around the world. Plus, ingredients are subject to the intense testing and verification regardless of geography of origin.